Soap remnants can be an unsightly mess on your sink or bathtub ledge. However, you can keep those unwanted pieces of soap from cluttering your bathroom or ending up in the trash can. By dissolving bar soap in water, remnants can be recycled to make liquid hand soap or laundry detergent. 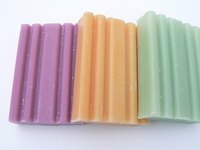 You can also dissolve soap in water to make body wash by adding extra ingredients such as fragrance oils and green tea. Gather your soap remnants, empty plastic bottle, funnel and cheese grater into a bowl or pot. Clear a large surface such as your kitchen counter or dining room table. Cover the surface generously with old bath towels to prevent making a mess. Bath towels can protect your surface by absorbing water and can be thrown in the washing machine after use. Shred the soap remnants with a cheese grater. Shredding your bar of soap first helps it dissolve faster in water. Add 1 cup of warm water for every bar of soap and stir the solution. Add more water depending on the desired strength of the solution. Use more water if you plan to use your solution as hand washing liquid and less water if you plan to use your solution as a homemade laundry detergent ingredient. Stir the solution with a clean wooden spoon or plastic spatula. Soap dissolves faster when water is in motion. If you used a pot, you can place it on the stove on the lowest heat setting. The heat causes the soap to dissolve instantly because of the soap's fat content. Set the plastic bottle on a flat surface. Place the funnel inside the bottle and hold it steady with one hand. Pour the liquid soap solution and watch the bottle as you pour, so that you don't overfill it.